"Since winning medals for cross country at the age of 16, I don’t think I’ve run any great distance, except maybe for the number 40 bus." Lifestyle 12 April, 2019 . Written by Will St Leger. Recently I spotted my bronze medal for cross country among the various awards that my brothers and sister have won for Irish dancing and GAA in our youth. Like most Irish households these medals proudly displayed in the living room as a reminder of our childhood achievements. Since winning that medal at the age of 16, I don’t think I’ve run any great distance, except maybe for the number 40 bus. Thirty years later, I wonder how fit I am? I don’t work out in the gym, I don’t swim regularly, but I do use Dublin bikes to move around and thankfully I gave up smoking 8 years ago, but that hardly makes me fit. I decided to take up the ‘Couch to 5k’ challenge with LGBT+ running group, Dublin Front Runners. My aim is to complete the eighth annual Pride Run 5k on Friday, June 21 2019. Supporting the Dublin Pride Run has been an opportunity for companies to support charities such as Headstrong, Belong To, LGBT Ireland’s Helpline, Shoutout, Outhouse and HIV Ireland. So everyone’s a winner. I talked to DFR member, Conor Byrne about what is involved for beginners like me. Conor assured me that doing a couch to 5k is about running at your our own pace and pushing yourself to meet your own goals rather than being solely a competitive race. Everyone has different levels of fitness and ability and you will find others in DFR that are at the same level as you. Couch to 5k is about getting you aerobically fit, – that means sustained exercises like running, that stimulate and strengthen the heart and lungs, thereby improving the body’s utilisation of oxygen. Getting aerobically fit means those flights of stairs at work become less taxing, those hill walks or sight-seeing trips become more enjoyable and dare I say it, being aerobically fit helps sustain activity in the bedroom too. Saturday morning I’m up at 8 am, I followed Conor’s advice to eat a breakfast containing slow release energy food. In my case, I had a bowl of porridge with some diced banana. I drank some water but made sure there was a gap of at least one hour before running (drinking too much water so close to exercise can make you feel sluggish). I dressed in running leggings, a comfortable running top (thanks Penneys), a hoodie and I wore decent trainers which have foot arch support. 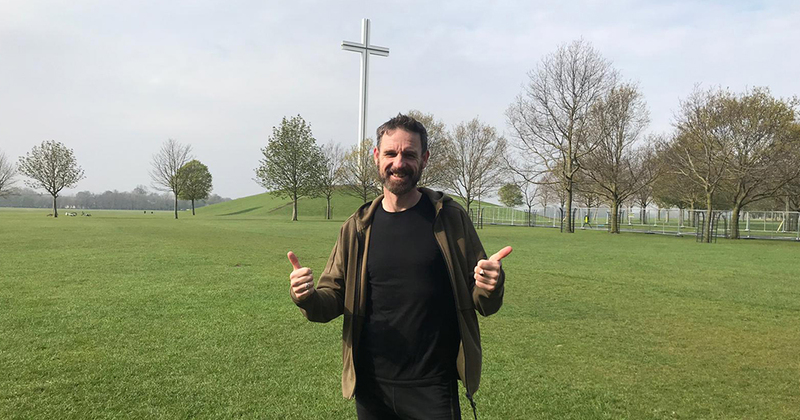 When I arrived at the meeting point in the Phoenix Park, I was delighted to see so many new people like myself taking up the challenge. LGBT+ people and their friends of all ages and nationalities, each with their own level of ability. I even met a few friends of mine that were also running for the first time in ages. Our DFR volunteer trainers talked us through the exercises and we started with some stretching and warm-ups to get our heart rate going. We then began a series of walking for 2 minutes followed by 2 minutes of running (at your own pace) We did 30 minutes of exercise in total. This regimen will progress each week from less walking time to more running until we reach the point where we closing in on our goal of running 5k. Afterwards, I felt good about getting up early, getting fresh air and meeting new people. My legs felt a little tender next day, but that’s my bodybuilding muscle and adaption to increased work. As I continue towards my goal of running 5k, I want to encourage more LGBT+ people to run more and increase their level of exercise and flexibility while making a few friends along the way. Dublin Front Runners run times are Monday 7.30pm from the Magazine Fort car park in the Phoenix Park. Wednesday 7.30pm from the Phoenix Cricket Club car park and Saturdays 10am at the Papal Cross car park. Couch to 5k details can be found on Facebook. 12 April, 2019 . Written by Will St Leger.